So in my New Years Thought I talked about how I had been challenged to a 366 Day Prayer Challenge. I wanted to post an update on that now that we’re almost 3 months in. 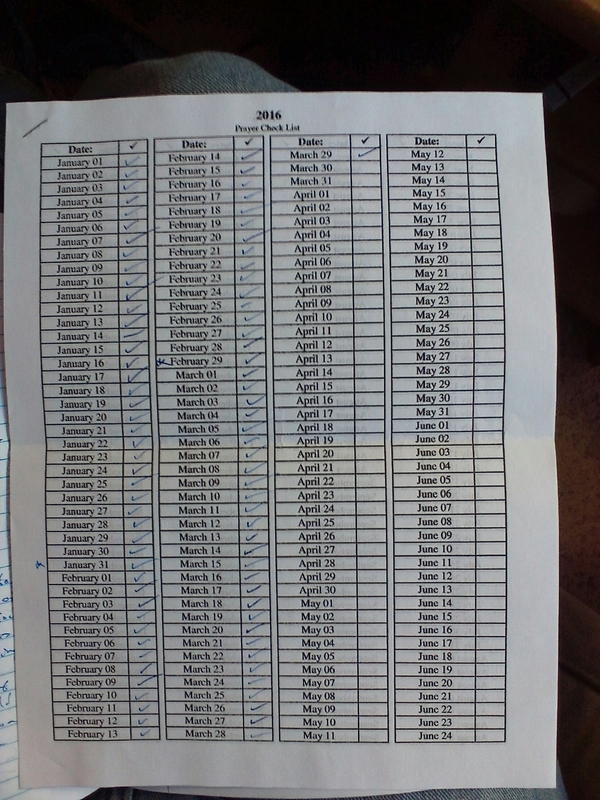 I’ve accomplished 89 continuous days of prayer. Now as stated in my previous post, this prayers written down, and so I’ve written down 89 prayers. I will leave you with the picture of my checklist. Well we have some exciting news in the works. All the poems that have been being published on this website under the title “Psalms by RB” are going to be published and available for purchase on the Kindle soon! We have capped Book 1 at 40 Poems (all of which are finished and going through light editing). Over the next few days the last five Psalms will be published here and you can look forward to seeing them on the Kindle in the next few months. This is the first publication to come out from Believe Better Ministries and we are excited and looking forward to it. Keep checking in here over the next few months to and we will announce when the book will be launched. The title of the book is Psalms by RB Book 1 and you can look forward to reading it on your kindle or smart device with a kindle app.